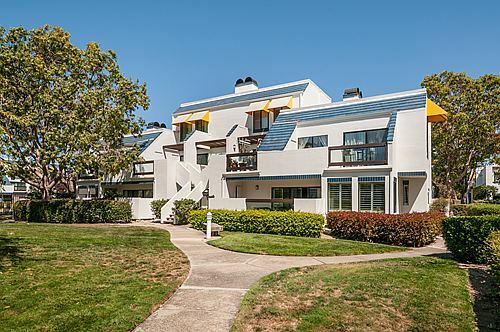 Nestled along the soothing waters of Foster City, this updated 2 bedroom, 2 bath condo makes every day feel like vacation. Built in 1975, the 1,490 square-foot property has been completely remodeled with Oak hardwood floors, a state-of-the-art kitchen and a retreat-like master suite. The second-level formal entry opens up to high ceilings framing a spacious living room. These gathering quarters feature a marble fireplace and a stunning skylight, bringing in streams of light from all corners. The open floor plan blends into a formal dining room with vaulted ceilings and direct access to a grand patio, overlooking the community’s landscaped courtyard. Black granite countertops and stainless steel appliances accent the gourmet kitchen’s cool tones and sleek lines. Beyond the private laundry room and walk-in hall closet sits a secondary bedroom with dual sliding door closets. The shared bath contains a decoratively tiled tub shower with Grohe fixtures. The condo’s sumptuous master suite offers a grand walk-in closet, private patio, and designer en-suite bath lined with stunning Delano stone marble. Located in the Island’s waterfront complex, homeowners can kayak and catamaran in the local lagoon or enjoy the community’s pool, hot tub, rec room, and gym facility. · Commuters will enjoy easy freeway access, while families are just a short walk to top-rated Foster City Elementary Schools and easy access to Edgewater Park.